When the politico-strategic crisis in the Doklam area of the trijunction between India, China and Bhutan erupted, though unrecorded, in London over cups of coffee, two hearts broke. Zhang looked stressed, irritable for the first time. He was not smiling. And he was not looking at Sneha directly. Heartbreak over Doklam is the story of a globetrotting generation of young people overpowered still by territorial and nationalistic boundaries so much so that a military impasse in a remote Tibetan outpost can shatter love and dreams of a future together. Maj Gen Dipak Mukherjee wrote his first book in 2015—a nonfiction titled Battle For Hearts And Minds From North East To Kashmir And Beyond. 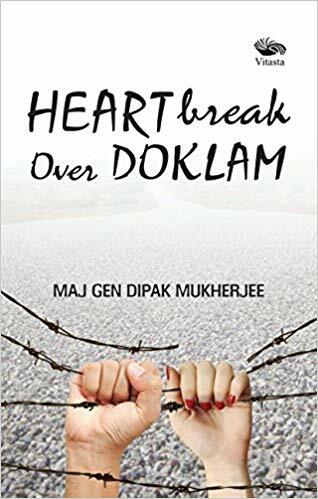 Heartbreak over Doklam is a fiction about the present generation of millennials in India for whom he has great admiration. It is his conviction that they will be the moving force to making India a great nation during this century, if given the opportunities and responsibilities. The author served in the Indian Army for forty-six years. He has a Masters degree in Military Science from Madras University, and a Doctorate in Management of National Security at macro and micro levels of governance.